Using an unusual long-term research installation in the waters off the west coast of Sweden, a team of researchers from Germany, Sweden and Norway decided to find out. Their results have just been published in Nature Ecology and Evolution. Most studies on the effects of acidified seawater on fish species are done in the laboratory, says Fredrik Jutfelt, an associate professor at the Norwegian University of Science and Technology's (NTNU) Department of Biology, who was one of the study's authors. Some of those studies — of which there are relatively few –show reduced survival for fish in their early life stages, he said. But studying fish in a tank don't necessarily give researchers the chance to study the entire food web. For that you ideally need to be able to study fish in their natural habitat, the ocean. That's where the experimental set up in Gullmarsfjord, Sweden comes in. 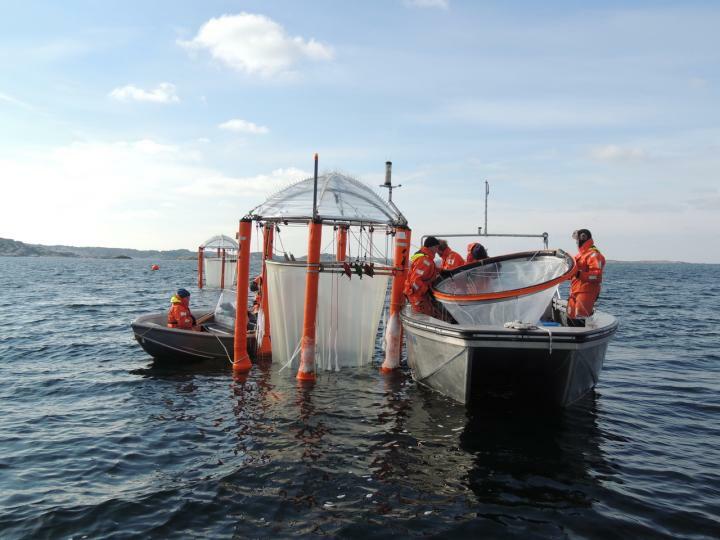 Here, researchers were able to use what they call "mesocosms", or tall vertical floating "test tubes" filled with ocean water, 2.8 meters in diameter and 19 meters long, which were set out in Gullmarsfjord. Each mesocosm contained 50 m3 of ocean water. Five of the bags were filled with "normal" seawater to serve as a control, while the remaining five bags were filled with seawater that had been acidified with CO2. The researchers used predictions of the amount of CO2 that would be in the atmosphere at the end of this century to set the CO2 levels in these last five bags. They then added fertilized herring eggs to all of the bags when the phytoplankton in the bags began to wake up and reproduce, in late April 2013. The herring larvae that hatched in both bags lived in and fed exclusively on the plankton in the bags until the experiment was ended on 28 June. The researchers took regular samples of the physical, chemical and biological conditions in the mesocosms. In the end, the researchers found that the young herring in the mesocosms exposed to elevated CO2 levels had a survival rate that was nearly 20 per cent higher than the herring in the control mesocosms. That's in direct contrast to laboratory studies that have reported decreased larval fish survival. "It appears that the herring will have an advantage over other more sensitive species in a future acidified ocean," said Michael Sswat, a researcher from the GEOMAR Helmholtz Centre for Ocean Research Kiel, who was the lead author of the study. "The surprising finding here was that while the herring were unaffected by CO2 in our simultaneous lab experiment, the herring in the natural ecosystem experiments in the mesocosms benefitted from high CO2," said NTNU's Jutfelt. "This finding was likely due to changes in the ecosystem, as that was the main difference between the lab and the field experiments. We also measured the ecosystem changes in the mesocosms and we saw that the extra CO2 stimulated growth of algae, which led to more zooplankton, meaning more food for fish." "The tolerance of herring larvae to pH changes could be due to their life history strategy. "Herring spawn mostly near the ground, where naturally high CO2 levels prevail. They are therefore probably better adapted to ocean acidification than other fish species such as the cod that spawns near the surface," Clemmesen said. "Whereas herring larvae were shown to be tolerant to CO2 levels projected for the end of this century, larval development in other fish species, including the Atlantic cod (Gadus morhua), is negatively affected under projected ocean acidification scenarios," the researchers wrote. "Also biodiversity of fish may be affected, as shown at natural volcanic vents, where changes in food availability and predation benefitted dominant fish species."